30lbs of Cat Litter only $3.68 w/ Coupon! Wow, you can get a 30-pound bag of Cat's Pride cat litter for only $3.68 at Walmart using this coupon! is this clumping litter, or clay? Does Cats Pride offer Clumping and will the Q work on clumping litter? thanks! @Anon, Sorry I'm just now getting your question! The litter mentioned above is clay, NON-clumping litter. 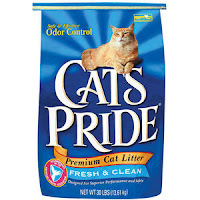 Cat's Pride does have clumping litter but it's a bit more expensive, around $7-$8 for 15-20 lbs. And the coupon can be used on any type of litter. Hope this helps!